I've won the 2013 CASS AWARD. Thanks to you, guys! The complete listing here. About the Clublog CASS AWARD here. The E44PM 2013 operation has ended at 05.00 UTC. 11'900 QSOs (10-80 m, mostly in CW, also in SSB) have been established this time. Thank you for the contacts! The raw log has been uploaded onto Clublog and LoTW. After the exorbitant runs on 40 m and 30 m the last two evenings, I took a paper bin and 10 m of wire to wind a coil for the existing 40 m quarterwave vertical in order to get E44PM into some european 80 m logbooks. After 202 QSO in 2 hours, the propagation went down. The highlight today was the sucessful sked with Zorro, JH1AJT, who needed E4 on 10 m in SSB badly. So glad I could give back something to this great DXpeditioner who has just now returned from XZ. I took a long recreational walk through Bethlehem and went also to the Groceries in the afternoon. When I returned to the shack, I found the mast broken because of the strong winds that can appear all of a sudden (800 m asl). I had to take the antennas down and replace the collapsable MFK mast by the spare one I brought along from my home in HB. I finished the repairs after midnight. But from the late afternoon till midnight I run a pile on 17 m with the vertical dipole that was not damaged. I chose SSB because two days ago I spent a lot of time on 17 m in CW. Openings to all continents, including loud W6/7 stations on the evening greyline. Nevertheless, only 11 hours of operating time; 1200 QSOs. 1632 QSOs established. Spent 4 hours in SSB on 15 m. The second half of the Qs were made on 20 m in CW. Another good W6/7 opening today, but this time on the evening greyline. 1729 QSOs, that's kind of a personal record. Hard work. Started in the early morning for the predicted 20 m path to W7 and logged Bob, W9KNI, as my first contact today. Later on, an 11 hours run on 17 m with openings to all continents. Thanks Nikolay, RI1ANP, for my first Antarctica QSO from Palestine. All contacts are on LoTW and Clublog. I will do the uploads every late evening UTC. Operation started, 17.41 UTC, on 21 MHz in CW, after a long day ... will get some rest now for tomorrow. Additionally, I will be running a Yaesu FT-817ND connected to a 6 m band ground plane, occasionally monitoring 50'097 kHz for CW sigs. I will be in Palestine again, signing E44PM in late August. I will be using my K2/100 and wire verticals. Logs will be uploaded daily both onto LoTW and Clublog. My E44PM license has been renewed. It is likely that I will show up from Palestine again later this year. The Swiss Ham Radio Magazine HB-Radio has published my DXpedition daily write-ups in its current issue (in German). The German Ham Radio Magazine FUNKAMATEUR has published my DXpedition report in its current issue (Title: "Funk-Weihnachten in Bethlehem"). QSL Update: I've answered all hundreds of direct QSL requests (by SASE w/IRC or $, Clublog/PayPal) as of today. There are still direct requests coming in. The first bureau batch is ready to be mailed. The DX Foundations have confirmed the reception of their batches. SWL Cards are welcome! I used to be an SWL from 1982-85 and still own the Swiss SWL call sign HE9CIU. Thanks to the following SWLs who sent E44PM a rprt: UA2-125-754, DE3RPC, DE0TMD, OK1-34856, I/50/OT, DE2EBF, HE9JAT, DE1HLD, F-10828, I5-008/ARI, SP0PLH, SP3003LG, DL-E34-2400993, DE6HSK, DE8AAM, OM3-2351, RK-4-10-PE, R3E-229, ONL-02943, NL-8992-R26, DE1GSW, OK1-17323, I8-1659-RC, OK1-11819, OK1-19193, OK1-401, DE1WDX, DL-E34-2400993, OM3-2351. Until March 2013. The QSL Cards have arrived yesterday from the Gold Print Service run by LZ3HI. Today, I've sent the first 80 E44PM QSL Cards to direct claimers in EU, W, VK, and JA. The rest of the Cards will follow in the next days; the Bureau Cards asap. In case you'll attend HAM RADIO 2012 in Friedrichshafen (June 22 to 24), pay a visit to the booth of the Swiss DX Foundation SDXF and collect your E44PM QSL Card there. You have to use the SDXF OQRS in advance! Free to all hams (SDXF membership not required). The QSL Card is ready to be printed. Have a look in the Gallery (link above). The QSL is a courtesy of Gold Print Service LZ3HI. Thanks Emil for the great donation! I've uploaded the E44PM log onto LoTW today. The file has been processed within a few minutes and 2279 of the 7415 Qs showed an immediate match. Thank you guys for recording my sigs! JA0RUG: E44PM on 21 MHz CW (Audio). IK0OZD: E44PM on 10 MHz CW (Video), E44PM on 14 MHz SSB (Video). IZ2MGN: E44PM on 21 MHz CW (Video). 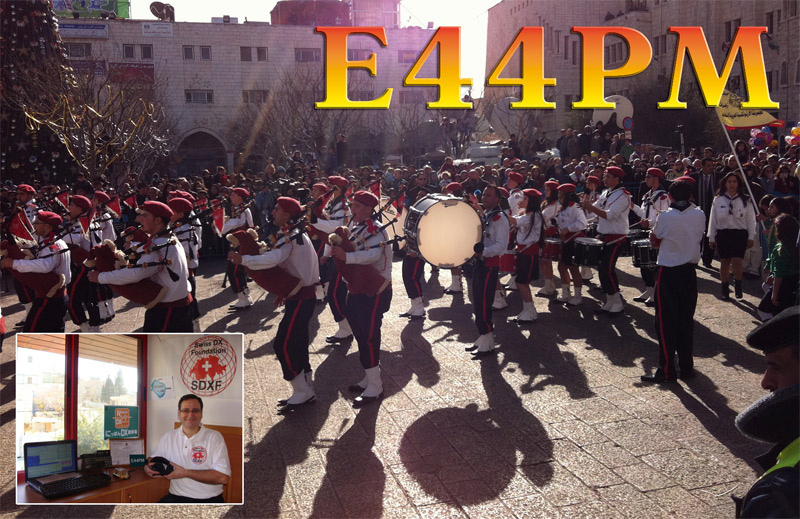 DX-World: E44PM on 21 MHz CW (Audio). I have published some pictures in the Gallery (see link above). The DXCC Desk has approved the E44PM operation today. The DXpedition E44PM has ended at 08.46 UTC today. I am very happy with the success of the operation. I thank all of you for your kind words both in e-mails and on air. It was a true pleasure both plunging headfirst into the huge piles and working the weak signal DX from W6,7/VK on calculated as well as surprising paths. A pile is a work of art, its shape, pace and rhythm build a unity of sound and communication. I have deeply enjoyed myself as E44PM. 7415 QSOs were established, of which 5558 contacts with EU and 1039 with W/K. That's almost one W/K after every 5 EU throughout the whole operation. A difficult task, since many EU stations were terribly angry with my NA and JA calls. But that's (jammers, cops, pirates) something you have to deal with in the pile-ups (today). I am now preparing the documentation for the DXCC desk and will upload the log to the LoTW after a thorough check asap (probably in some weeks). The raw log can be found online at Clublog.org (see section link above). The pictures of the shack and antennae will follow in the coming days. The QSL cards will be typeset, printed and donated by LZ3HI and should be sent to me in Switzerland probably not after April 2012. I will keep you informed on this matter. I would like to thank the Minister, the Deputy Minister and the people at the Ministry of Telecom of the Palestinian National Authority for making this operation possible, and Yvonne, HB9ELF, of the Swiss DX Foundation SDXF, for her fast help. A salute goes to the Israel Amateur Radio Club IARC and its officials who showed true ham spirit and international friendship. Again THANK YOU guys in the ether for your support and high spirits that made everything more than worth while to me! The big surprise to myself is: I've reached the 7000 Qs mark, something I could'nt ask for before the DXpedition. In fact, 7106 contacts are in the log so far. Nevertheless I was slightly annoyed by two things: the notebook caught RF again, seriously this time, and I had to use the Netbook instead (200 Qs on 15 m CW, all paddled by hand) until the next break. I could fix the RF infected notebook with system restore software, and the thing is doing its job again. No loss of data, thanks God. The other incident: there was someone pirating my call for about an hour on 20 m CW while I was on 17 m CW. Note: No 20 m CW today from E44PM. The day began at 05.20 UTC on 40 m for roughly an hour of EU traffic (and some JA), before I started a long routine on 15 m. In the 5,5 hours I experienced the huge EU pile and a nice and long opening to JA (06.50 to 07.50 UTC; including some VK/ZL stations). My SSB duty was fulfilled today on 20 m where I stayed for a crazy hour: the pile was huge, and the discipline low. I ran the show by numbers, but it took much energy from me. I switched to 17 m CW and stayed there for three hours, serving a lot of K/W stations. The path to the West Coast opened at 15 UTC und closed around 16 UTC (6 p.m. local). Before and after that period the East Coast and Oceania came in simultaneously. I called "e44pm na vk/zl" which is nice to do. There was even an US cluster spot about this encouraging fact. In the early evening I worked the pile on 40 m CW because I saw with the help of UCXlog that there were a lot of stations calling that were looking for the first contact with me, some probably for the first Q with E4. The radio day ended with a pile of JA stations at around 21 UTC. Tomorrow, December 22, I will close down the station at 08.30 UTC. That's when the DXpedition ends, at least on air. I'm happy that so many things worked out very well. The day began with a big surprise. I woke up really early, in order to try out 30 m condx for the US. I had a feeling that it could work out this morning - and indeed I could log the first K/W at 01.53 UTC (that's close to 04.00 local) followed by many more as the dawn came closer. A special treat was to work Bob, W9KNI, and other West Coast stations on this special path. I insisted until 04 UTC when propagation to the US failed. The log reads: 93 K/W, 4 VE and one KP4. I am sure these stations appreciate. I was happy enough to experience a similar emotion in the early afternoon when some US station requested E44PM on 10 m CW. The opening was predicted to be very short 13.30 to 14.15 UTC, but I managed to serve the guys: 46 K/W, two PY, two LU. Unfortunately, there was a 3B8 right beneath my calling QRG. There were two cluster spots indicating E44PM on the wrong 10 m CW QRG. I am sorry for the guys who thought they worked me but in fact had a QSO with the 3B8. It is hard to tell them in the e-mails that they are not in my log. But 46 are. In the afternoon I chose 15 m because the band was wide open and also because I already had served the West Coast with 30 m in the early morning hours. The pile became huge quickly, I could easily work W/K (also West Coast) as well as JA, but after 30 minutes some EU guys decided to jam the QRG heavily. I heard the stations calling but they didn't come back to me - a clear sign that someone is messing with your tx QRG. I was forced to QSY two kHz down, but all of a sudden the propagation dropped from great to zero, anyway. A West Coast station sent me an e-mail confirming this fact. I gave 40 m a try in the late afternoon and early evening, just to polish the QSO rate a bit after so much DXing on 30 m and 10 m today. At the end I noted 1039 Qs adding to the total of 5864 contacts. My goal was to reach 4000. My dream was 5000. Now it seems that I will reach 6000+ in Bethlehem. Since the sheer number is worth noting, I am glad that "in spite" of the large QSO count I could help the deserving in whatever they are hunting - DXCC, Challenge or DX Marathon. Good night, ether. Today I focused on the band slots that needed some work. I began during local sunrise on 40 m with a EU pile, since all the other bands were dead. After 1,5 hours I left for 15 m where I stayed for three hours working a huge EU pile and many JA stations as well (also some VK/ZL, KH7, and a KH2). That was a very satisfying experience! After a short break I pluged in the mike connector of the ProSet to the K2 and worked 10 m SSB for 1,5 hours until propagation failed (only EU, except one ZS, one PY and one LU; 167 Qs in total). SSB is not my favourite mode ... I changed to CW again and took advantage of an open 12 m band. After almost two hours and many W/K contacts, propagation went down. But 17 m was wide open by then, I first worked some EU stations there and soon called for NA. Some EU stations got angry about that and jammed both my signal and the RX frequencies (I work split). It took a long time for some EU to understand why I was looking for the NA path: dozens of US stations made the log, many from W6/7. Some guys from the US reported on the cluster that my signal was SP into the East Coast und LP into West Coast. That was thrilling. After a short dinner I gave 30 m a try for one hour, catching many EU but only one JA. The bands where quite dead after sunset. So I decided to switch of the rig and go to sleep early, hoping for better condx before sunrise. Today I made 1089 Qs, totalling 4729 contacts after four days of operation. I am very happy with the 17 m vertical dipole that once again made a great low angle job. The K2 is doing its duty without any complaint - great small radio! In order to repeat the 15 m run to JA, I stood up early again trying 40 m first for 2 hours (good pile with occasional K/W) and then 15 m. But the condx were quite different from the day before, almost no JA on 15 m from here, EU pile instead. In the middle of the morning local time I switched to 12 m for some 2 hours of SSB (furious EU pile). Later on I QSYed to 17 m for some serious EU and K/W pile for 3 hours, including a long path opening to W6/7 (as the Californian guys discribed the path in the Cluster). I had a proper dinner tonight before I took the advice of the PY hams to try 20 m long after dark. I stayed for 2 hours on that band and worked a bunch of PY, LU and also TI, CX, but in the same time several VK and ZL as well as East and West Coast K/W. What a strange variety of paths! After 20 m closed for good, I gave it a shot on 40 m where a big pile was generated quickly. Many JAs and also K/Ws found their way to the E44PM log. Today no work on the antennas. Had a slight RF problem with the notebook but could fix it quickly. Several uploads to Clublog. I logged a "record" 1304 contacts with my simple wire antennas on one and the same fibreglass mast. That's 3638 Qs so far. Thank you! After a short but relaxing nap I started well before sunrise with a good run on 30 m followed by a massive JA pile on 15 m in the early morning hours. In the early afternoon I tried 12 m which brought me to a huge pile both from Europe and US including an opening to the West Coast in the middle of the afternoon local time. Later I did the first SSB QSOs (17 m) but the propagation was down, the same when I forced 40 m again in CW in the evening - (almost) no callers. A satisfying day with huge piles from US and JA adding up to 2334 QSOs for now. Clublog updated. First picture from Bethlehem uploaded in the photo section. Next shift begins 05 UTC. Good night. Today in the early afternoon I improved the radial system for the vertical which is attached on the 10 m long fibre glass mast. The signal improved, I had a great run on 40 m to JA in the late evening hours local time. Earlier on, in the late afternoon local time, the pile of West Coast stations on 17 m on the grey line was also very satisfying. I use a vertical dipol for 17 m and was again surprised by the performance of this kind of simple yet efficient DX aerial. Today I also uploaded the first QSOs on Clublog.org (see below for link). That's 1027 Qs for the first 26 hours of my stay in Bethlehem. Not sure whether I can keep the pace. Thanks for your continuing support. Operation started Dec. 15th, 20.48 UTC, on 7 MHz, in CW. First Call in the Log is HB9DX, The Swiss DX Foundation, with president HB9DDO at the key. Unfortunately, terrible QRM was encountered here, caused by all kind of electrical devices in the house (Neon lights, Air condition etc. ), peaking S9 + 10 dB on the K2 meter. Will check possibilities today for trouble shooting, including antenna relocation. Thanks for obeying my regional intructions, excellent operating by the EU ops during JA and K/W openings. Taking into consideration the many e-mails from SSB Ops, I will try to spend not less than 20% of the time in that mode. CW will be main mode. Operation most probably starts December 16 and will last 7 days. Thanks to Fred, KI4EZC, for calculating the grey line paths from E4 for December and sending me everything in pdf form for a print-out. Also today, I've added the planned E44PM operating frequencies. The Palestinian Authority in Ramallah has this day issued the license (which was granted May 25, 2011), signed by the Minister of Telecommunications, the callsign beeing E44PM. Therefore, the previously announced callsign E4/HB9IQB will not air. Thanks to the Swiss DX Foundation for the kind financial support. Members of the SDXF may use the SDXF OQRS for E44PM Cards. Mitglieder der SDXF können QSL-Karten von E44PM im OQRS der SDXF beantragen. Members of the German DX Foundation may use the GDXF OQRS for E44PM Cards. Mitglieder der GDXF können QSL-Karten von E44PM im OQRS der GDXF beantragen. Donations for this DXpedition are highly welcome. Any amount larger than € 3 or US-$ 5 is suitable. Kindly use the button in the Donate section. Merci to the Clipperton DX Club for the kind financial support and thanks to Marios, 5B4WN, and Michael, G7VJR, for upgrading the E44PM Clublog.org search to Expedition mode. Please adhere to the DX Code of Conduct. Thanks to the Nippon DX Association for the kind donation. License has been granted by the Ministry of Telecommunications & Internet Technology, Ramallah, for 160-10m, 100 W PEP, CW, SSB, DATA, signed by the Deputy Minister. Look for my sigs from E4 around the second and third week of December 2011. I will probably concentrate on CW and the WARC bands, depending on W6/7 and JA openings. Low band not planned. The rig is an Elecraft K2/100 with KAT-100, powered by an Alinco PS DM-330; Scheunemann paddle, Heil Pro Set 4, Microham periphery, Notebook, UCXLog (tnx Ben). As always, I am using DX Wire fibreglass masts and wires for vertical dipoles and verticals. Check the gray line propagation paths from E4 to your QTH calculated by Fred, KI4EZC (pdf for a print out). E44PM is a One-man-DXpedition by HB9IQB. Peri was first licensed in 1985 at the age of 18. 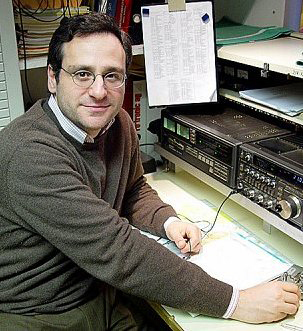 His first DXpedition took him in 1990 to then semi rare CW DXCC entity 5B4. He was active for instance from 3A, HB0, TK, VE3, YO9 and as J49PM (1st Place SV/SV5/SV9 WPX CW 2004 SOAB) or J45PM (DARC Hero of the WAE CW 2005). While living in Berlin, Germany, from 1995-2007, he was assigned the callsign DJ4PM. Peri also holds the callsigns M0IQB and KI1E. He was a visiting professor at MIT. He holds a philosophical degree of the University of Zurich and today works for a quality newspaper in Zurich, Switzerland. He is married and has a daughter and a son. He has written more than a dozen literary novels and story collections for which he has been widly acclaimed. For more informations check www.hb9iqb.ch or www.monioudis.ch. Have a look at pictures of the E44PM DXpedition. Donations for this DXpedition are highly welcome. Please send an e-mail to operator@hb9iqb.ch or, more conveniently, kindly use the PayPal Donate button below. Any amount is welcome, but please donate more than € 3 or US-$ 5, if possible, since PayPal takes its fees. If feasable at all, the log will be uploaded periodically during the DXpedition both onto Clublog and LoTW. E44PM Online log on Clublog.org. The December 2011 log has been uploaded onto the Logbook of The World (LoTW) 3 weeks after QRT. You can also use the E44PM OQRS at Clublog.org. Just check your Qs there and click on QSL request after having found them in the log.